Wild animal prints have come roaring back onto the fashion scene of late. Animal prints are actually one of the longest standing patterns in fashion, seen everywhere from lingerie to shoes to blankets and curtains. Animal print stays popular because it can be used so diversely in different styles. A mini dress that has an entirely leopard print can have the wild, fun and flirty look while a black mini dress with a leopard print trim or leopard print shoes add an edge to an otherwise classic outfit. Many wear animal prints to reflect their version of their own personality adding charm, romance and confidence. 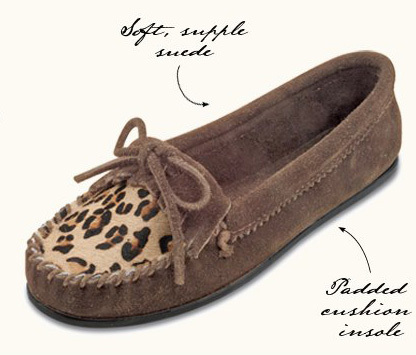 Our Minnetonka Women’s Suede Leopard Kilty Moccasin has a modern and classic look. I love this pair! Its modern meets classic a perfect combination, pure genius. Love these mocs! Minnetonka hit a home run with these. So in style with the leopard print! They are comfy and look great with jeans, sweats and casual pants. Love the soles on them too!